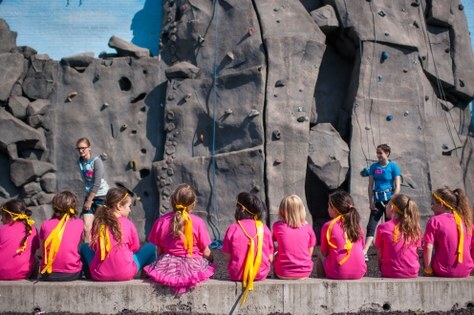 Tacoma Mountaineer Christy Pelland talks about what it's like to raise two active girls, how they inspired her to create Wild Skills, a free day camp for girls, with SheJumps. In a recent conversation with my mom, she told me she regretted not taking my sisters and me camping and hiking more when we were little. As a single mom, it just seemed impossible at the time. The outdoors can be intimidating, even more so when you factor in lack of resources, zero community, and being female. She feared being alone out there and not knowing what to do. She didn’t want to waste our time doing something that could put us at risk. The only time I do remember hiking was at Comet Falls in Mt. Rainier National Park. I can still vividly recall the feeling of standing on the bridge above the roaring water — it felt so dangerous and real, so raw and wild. Those emotions sparked something deep inside that has stuck with me my whole life. I have two daughters of my own now, ages 6 and 9, and am passionate about giving them the adventures I missed out on. Where I pursued organized sports — the ‘safer alternative’ — my girls are spending weekends rock climbing, stand up paddleboarding, and skiing. They are learning the ethics and skills to Leave No Trace, how to navigate, and how to put on a bandaid (and more) when the situation calls for it. They get to feel those raw emotions I remember from my Comet Falls hike every weekend. Part of the reason I’m able to do this is because I discovered SheJumps, a community of female adventurers committed to getting more women and girls into the outdoors. The SheJumps mission is to increase the participation of women and girls in outdoor activities. The SheJumps community consists of females of all backgrounds and ages who help one another reach their highest potential through outdoor adventures and education. Through it, I’ve met ladies whose personalities are bursting with enthusiasm and light; the kind of light that comes from being stoked beyond measure for the adventures to come. I knew I had to be more involved in this organization. When you think about organizations for boys, what comes to mind? Survival skills and exploring. Getting dirty, building fires, and learning traditionally “masculine” skills. What comes to mind when you think about organizations for girls? Cookies. SheJumps is here to disrupt that norm. It’s not about painting the landscape pink with lady power, it’s about creating a fun, encouraging experience for young girls to be introduced into the skills they need in order to effectively get out and explore. I’ve met many outdoor women who share a similar childhood story to mine: sports-absorbed tomboy who shuddered at the thought of anything ‘girly’. I wanted to be a boy - things seemed so much easier for them. Boys didn’t have to prove themselves all the time because, hey, boys were always expected to be good at sports and general outdoorsy toughness. I had a chip on my shoulder for decades as I fought for a spot on the field. Now that I’ve embraced my femininity in its own right, I’ve realized how much strength our female community shares. That’s why we created the Wild Skills day for girls, a free day camp for girls aged 6-13. The idea for Wild Skills formed from the desire to create a youth initiative format we could duplicate in every region no matter the varying partners or resources. We settled on the idea of outdoor skills that could be applied in any season or activity. We were so excited to partner with The Mountaineers to make our dreams a reality. Our organizations share the values of being volunteer led while giving people the skills to get outside. The outdoors can be intimidating, and it gets worse when you factor in lack of resources, community, and being a female. Whatever opinion you have on the state of gender equality, there’s no doubt that females are underrepresented in the outdoor industry. Statistics show the gender distribution of outdoor activity participants in the United States from 2009 to 2014 were 46 percent female. That’s darn near half yet the outdoor industry still struggles to represent. Are we less competent in skills? Is it that there is truly less women ‘crushing it’ out there? I don’t think so which is why we’ve chosen to take an active role in this conversation by changing it. Putting aside ideas of the ‘token female’ that has to ‘prove herself’ and setting a standard for education, community and encouragement in the next generation. Wild Skills youth events teach girls the survival and technical skills they need for outdoor adventuring. These skills include first aid, navigation, leave no trace, and shelter building. Our goal is to see girls learning, having fun, and connecting in an encouraging environment with amazing instruction and support. We want Wild Skills to be an experience they will remember; one that will spark a lifetime of passion for the outdoors and will remind them they’re capable of anything! One SheJumps participant who discovered her capabilities with us is Victoria Ochido. Ten years ago, Victoria moved from Kenya to Washington where she stumbled upon an online video piece about SheJumps. She remembers calling her fiancé and yelling, “I’ve found my tribe, and they’re right here in Washington!” Up until that point she was frustrated and lost as to how to get started exploring in the outdoors. A key component of the Wild Skills program is the female-to-female mentorship. The skills are being taught by big versions of the participants — the instructors even wear matching tutus! The best way to lead is by example. We put that to motion. It’s not uncommon to see a grown woman sporting a girafficorn costume at our events or young girls in tutus rock climbing. The costumes and our girafficorn logo are by design. We’re doing it because it blatantly says ‘I’m having a blast!’ and ‘you should join me!’ Creating a standard of inclusion through ridiculously optimistic fun is in our roots. This spirit is carried into all that SheJumps does from fly fishing clinics; to wilderness first aid courses; and our annual ski mountaineering course for women, the Alpine Finishing School. The premise for all of these programs starts with the core idea of “jumping” to challenge yourself and give back. At the Alpine Finishing School, for example, we furnish the participants with direct access to some of the top female guides in the world, exposing them to the highest echelon of outdoor adventure in a safe but adventurous setting. Then those jumpers come back as volunteers to help less experienced ladies. Outdoor skills taught at young ages instill confidence that transfer to all areas of life. It’s very unlikely you’ll sit down with a six year old and share why you truly need the outdoors. She won’t understand how you grappled with the sorrow and bitter truths of life by escaping into the solace of the wilderness. She just isn’t ready for that. What she needs is to see a woman who loves the natural world and appreciates the wonders and endless benefits it offers. In time, she will find it for herself if that’s what she chooses. But it is the exposure to that path which offers answers before there are even questions. There’s so much to learn about ourselves through the outdoors. Lessons that are not commonly found in our busy, everyday lives. Our goal as an organization is to grow Wild Skills into a long term mentorship model that provides young girls a community connection to other women and the natural environment. It’s the introduction and foundation for what we hope will become a life lived with purpose, inspiration, and priority for time in the outdoors. In the end, it’s not about how extreme you get — It’s not about the highest peaks or the remote adventures. SheJumps wants to show there’s always space and time to get outside, and that your personal definition of fun will evolve over time. It’s our vision to provide skills and the community that fits your life, wherever you find yourself on the journey. Christy joined SheJumps in 2014 as an Ambassador and quickly transitioned into Regional Coordinator for Washington State. In the spring of 2015, Christy designed the curriculum for an event called “Wild Skills” which blossomed into the Wild Skills program you read about here. She is now the director of Wild Skills, focusing on teaching foundational outdoor skills to girls. Outside of SheJumps, Christy is an adventurer, wife, mother of two girls, skier, photographer, and illustrator. Christy’s outlook on life is all about positivity and defining success to mean living a full life — something she’s excited to share with the next generation of women. Learn more about Wild Skills and SheJumps at shejumps.org. This article originally appeared in our Summer 2016 issue of Mountaineer magazine. To view the original article in magazine form and read more stories from our publication, click here.